Star Track Fasteners Pvt. Ltd. presents in association with M/s RAWIE - GmbH, the latest techniques for Track End Closure Systems i.e. Buffer Stops for Railways & MRTS applications. Job Description - Sliding Buffer Stops: Through the mass of the train and the velocity generated kinetic energy will go into effect via the inerface of the train ( side buffer and / or central coupler and / or anticlimbers) into the buffer stop frame. During the movement of the friction buffer stop on the running rails, the friction elements translate the kinetic energy into heat. 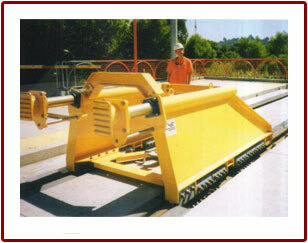 The length of the sliding distance depends on the quantity of the inserting friction elements. Over 45000 buffer stops of different types and energy absorption capacities are in service world wide including the more recent MRTS and Metro Railways. Rawie has developed and supplied buffer stops to suit all requirements from full train load of 7500 tons weight at 10 kmph to units weighing at 120 tons at 65 kmph. 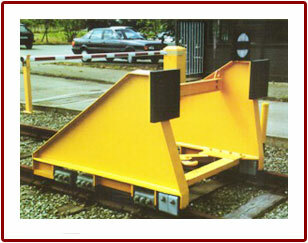 Rawie has also developed special buffer stops for use in Railways, Tramways, Light Rails, MRTS & Metro Railways. To secure passengers in the train. To secure persons behind the track end. 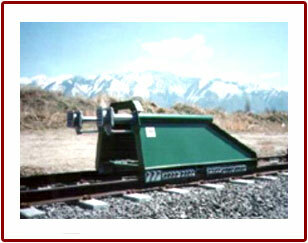 To secure objects at & behind the end of the track. To limit damages to the trains. To avoid derailment of the trains. To show the end of the track. To arrest the train up to a defined crosspoint. Calculability of arresting of the trains, therefore calculable operating conditions. Calculability of security of arresting of the trains, therefore also calculable special operating conditions. Calculability of the acting forces within the track end systems. Buffer stops are designed to make it more resistant to corrosion to perform trouble free in high humidity, monsoon seasons and aggresive industrial atmospheres. The company is able to provide static structure analysis of buffer stop, by an independent company to certify that the buffer stop body can absorb the impact without the deformation when train hit the buffer stop. The company have a test ring where the function of the friction elements, the most important factor to guarantee the performance of the Buffer stops are constantly being tested.